If you join with no Roman Reenacting experiance or equipment you do so as a Volone. To get to the next step you will need the Tirone kit. As a Tirone you will be expected to complete all of the training mentioned below as well as the Probatus kit to become Probatus, a trained recruit. Upon becoming Probatus and swearing allegiance to the Emperor a new recruit would be given the Stigmata Puncta Signorum, a Tatoo/Brand with the Legions and Emperors name. The next step to becoming a Legionary requires completing the Basic Legionary kit. If you join as a Veteranus, a trained and experienced Roman Reenactor, just keep updated to your Cohorts/Groups message board or website. Your Decanus along with the Optio and Centurion are responsible for your training. This is a brief outline of the training you need to become Probatus. 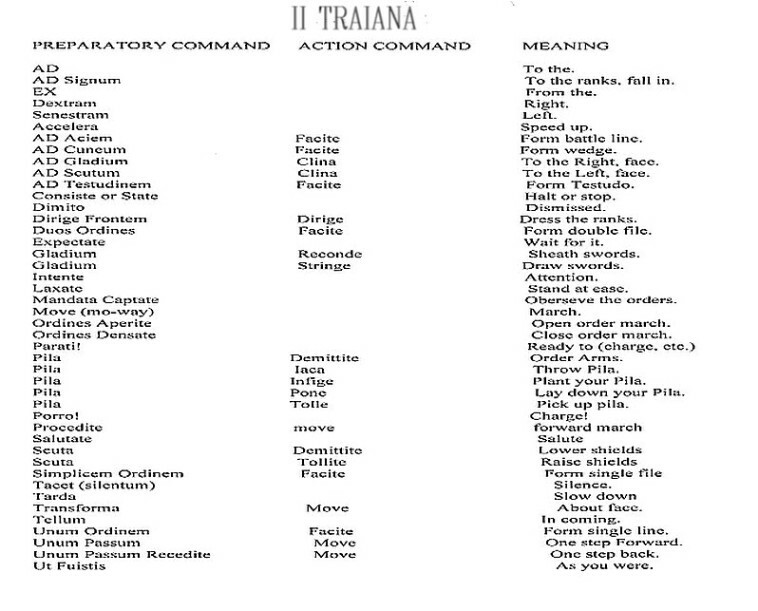 Below is a list of commands (to save a copy for yourself just right click and save pic as). Orientation: Introduction, Commands and Muster drill. Marching Drill: My feet hurt already! Gladius & Pugio Training: Offensive, Defensive and care of. Pilum & Scutum Practice: Learning how to use both offensive and defensive. Tatics: Battle formations & maneuvers. Camp drill: Building defenses, layout, etc.